Beach Towers, at 1600 Beach Avenue and 1651 Harwood (at Cardero). On February 26, 2013 Vision Vancouver approved the Beach Towers rezoning, against votes of the opposition Councillors from NPA and Green Party. 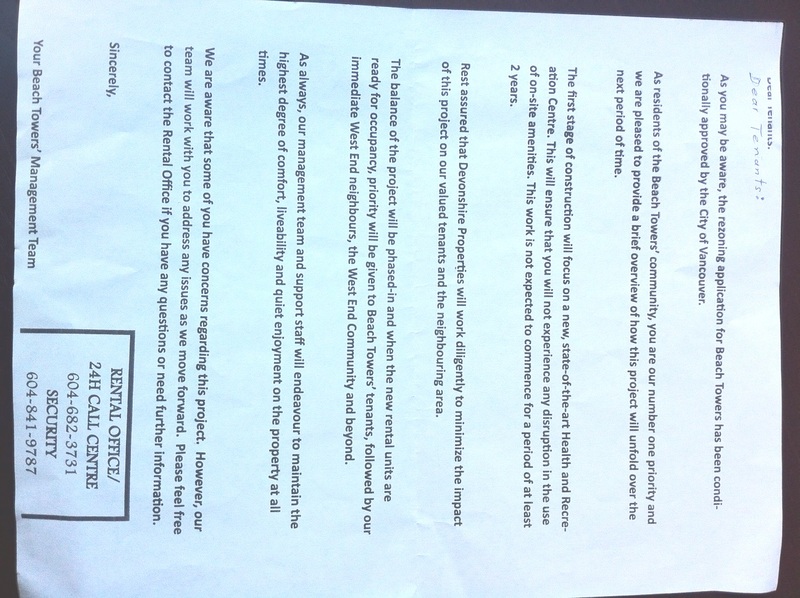 5-Jun-2015: Devonshire Properties issues letter to tenants saying that “Beach Towers Construction Is Not Proceeding.” Residents and neighbourhoods expressed relief. See our article here. 20-May-2014: As of today, there is still no sign of any preparatory work whatsoever. No signs. No surveyors. No change. At night, the towers appear to be generally occupied. No information has been announced publicly about demolition/construction plans. If you have info to share, please e-mail info@westendneighbours.ca. 23-Aug-2013: The first signs of action — Two workers were sighted doing road surveying. They confirmed that it was for the Beach Towers site. TIP: Before the construction work begins, tenants and neighbours are encouraged to get familiar with City regulations intended to protect you from the negative impacts of demolition and construction. Learn your rights, learn from the experience at 1401 Comox. www.1401comox.ca, and get engaged early with Devonshire Properties to get some ground rules set. It may be worth creating a tenants/neighbours committee to meet and negotiate with Devonshire — to create ground rules for communication, complaints, and minimizing disruptions and hardship. CityHallWatch provides a free downloadable checklist to guide citizens in evaluating and preparing for demolition/construction projects (Demolition-construction impacts, citizen appraisal form, CityHallWatch, 17-Apr-2012). More tips/info are here. Minutes and video clips of the Feb 26 Council meeting are here. Here below are some links for some media coverage, plus YouTube video of four selected Councillors in their explanation of why they voted for or against the rezoning. The Public Hearing for this application ended late on Wednesday, February 20, 2013. Council. From our initial analysis, of correspondence received by City to Feb 19 there were 23 letters in support, 126 opposed, 12 “other.” Of speakers at the hearing, 6 were in support, 31 opposed. In addition, over 13,000 people have signed the WEN petition calling for a halt to spot rezonings and the development of a comprehensive plan for the community. And more than 300 people signed a petition specifically opposed to the Beach Towers application. It’s clear that the voices of the community were largely opposed to the project — for many substantial reasons. The outcome of the Council vote on Feb 26 is an open question. We are hopeful they will show good discretion by rejecting the application, based on the compelling reasons presented. Many in the community will be disappointed if the project is accepted at all, and it could sour the neighbourhood’s relations with City Hall in the current community plan process. The main criticisms were about how much the building size and form would negatively affect the neighbourhood, to allow for the construction of expensive rental units which are expected to do little to address housing affordability challenges. If Council approves the rezoning, the property owner will gain at a great cost to neighbours and the broader community. City Council could earn goodwill by rejecting this application now. The application is by IBI/HB Architects, on behalf of an unlisted company named Beach Towers Investments Inc. (associated with Devonshire Properties) for a major infill development at Beach Towers (1600 Beach Avenue and 1651 Harwood Street) in the West End. The proposal features several new buildings to fill up the site, including a 4-storey residential building, 2-storey townhouses, a new 9-storey tower, and more (details below). Download the staff report (which summarizes public comments received, most against the proposal) in PDF format by clicking here. Staff disagreed with the public input. For the City’s official information about the proposal click here. For official information about rezoning and how to express your opinion to Council, click here. For information and analysis about the proposal compiled by West End Neighbours, click here. See also this website about the Beach Towers heritage value and more: www.beachtowers.ca. Media release by Beach Towers Neighbours is here. This application is made possible only because of the Short Term Incentives for Rental (STIR) program adopted in 2009 with no public input and which WEN believes is legally flawed, and about which WEN has written to Mayor and Council. WEN believes that a basic question the public should ask related to developments like Beach Towers (being considered under the Short Term Incentives for Rental – STIR – program) is about the tradeoffs. Should the City of Vancouver forego the regular charges developers would pay on a development, in order to create market-priced rental units, particularly by adding more density to a block that is already one of the most densely developed blocks in the West End. Council has the option of rejecting or accepting the application. ***************** Text below, from prior months, will be updated soon. The official city website for this rezoning is here. Update (4-Feb-2012): The Vancouver Heritage Commission supported this project on November 14, 2011, and Urban Design Panel supported it on November 16. Next step is likely to be a public hearing for the rezoning. People are encouraged to participate and let City Council hear their opinions when the date comes up. As of today, people close to the project have heard no news. We have covered this project extensively. Search for “Beach” on our website top page to find all the articles. A local group of Beach Towers Neighbours prepared a review and Critique of the Beach Towers rezoning proposal, rev July 2011. It is another of several major rezoning applications under the controversial STIR program that WEN has been watching and it is a part of the cumulative impacts of rezonings being rushed ahead in the West End in the absence of a meaningful comprehensive plan. This is a video courtesy of “Beach Towers Neighbours”. More updates are below. Update 20-June-2011. The Vancouver Heritage Commission voted unanimously not to support this project application. See video here for reasons. June 9, 2011. Mayor’s Advisory Committee meetings stated that the Urban Design Panel would review this application on June 15, 2011, but a citizen inquiry with UDP secretary found that for unspecified reasons it was removed from the UDP agenda. We will report more as information comes in. Public Open House was held Tuesday, May 31, 2011 at Coast Plaza Hotel, 1763 Comox Street. Public open houses like this are a required part of the rezoning process. It was hosted by the City, but the applicant was there to provide information. The City is still accepting comments. You do not need to provide identifying information. IBI/HB Architects, on behalf of Beach towers Investments Inc., has applied to rezone to add 137 dwelling units to the existing 600 rental apartments in four towers (19 to 21 storeys) on two sites (1600 Beach Avenue and 1651 Harwood Street). The application proposes (1) along Beach Avenue, to add a five-storey residential building with two-storey townhouses at grade and three levels of housing above, and a partially submerged one-storey amenity building, (2) at corner of Harwood and Cardero Streets, to add an eight-storey residential building, and (3) along Harwood Street, to add two 3-storey structures, containing 9 townhouses, on either side of the existing Columbus House building. The proposal would add approximately 105,000 sq. ft. of floor space. This application is under the Short Term Incentives for Rental Housing (STIR) Program, which subsidizes the creatin of market-priced rentals by relaxing regulations and giving developers taxpayer-funded incentives. A majority vote in City Council adopted the STIR program in 2009 with no public consultation. April 13, 2011. The Beach Towers owner has submitted an application to rezone the Beach Towers’ complex to build 139 apartments in three mid-rise buildings. West End residents are encouraged to review the 1600 Beach Avenue rezoning application on the City’s website. Home to a large population: approximately 1200 residents – more than two percent of the West End’s population – live in Beach Towers. Beach Towers’ residents have not been informed of the current application. March 10, 2011. In the past few days, the City website updated the information on this application. Key aspects of the application are (1) along Beach Avenue, adding a five-storey residential building with two-storey townhouses at grade and three levels of housing above, and a partially submerged one-storey amenity building, (2) at the corner of Harwood and Cardero Streets, adding an eight-storey residential building, and (3) along Harwood Street, adding two 3-storey structures, containing 9 townhouses, on either side of the existing Columbus House building. According to the City, the proposal would add approximately 105,000 sq. ft. of density, resulting in an increase in floor space ratio (FSR) from 3.42 to 4.33 maximum permitted under current zoning is 2.2 FSR). The applicant has applied under the Short Term Incentives for Rental Housing (STIR) Program and all the residential units are proposed to be market rental. Full information, including downloadable documents are here. The online public comment function is open (we invite you to send copies to info@westendneighbours.ca). No date has been set yet for an open house or public hearing. December 3, 2010. A formal rezoning application was submitted to the City on November 29 (details are not yet on the City website). 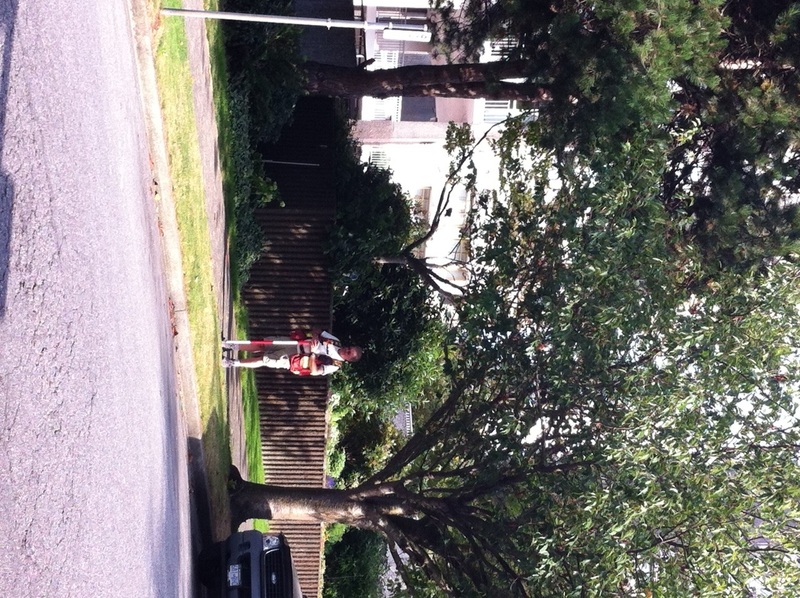 City Contact – Rezoning Centre, 604.873.7038. The proposal is for one 8-storey building at the corner of Harwood and Cardero Street, one 5-storey building along Beach Avenue and a 1-storey amenity building at the corner of Harwood and Beach Avenue. It will increase the total density (floor space ratio) by 109,087 square feet (10,134.5 square meters). 121 new parking stalls are proposed. For more information, see our Beach Towers Website. Following the planning department’s rejection of an initial proposal to build a fifth tower on the site, the owner (Devonshire Properties) has submitted preliminary plans for high-density infill surrounding the four towers, including a wall of 57 stacked townhouses on Beach Avenue, an eight-story, 94-unit building on Cardero and Harwood and 13 townhouses surrounding the North tower. See the “Beach Towers Letter of Enquiry for Proposed STIR application“, June, 3, 2010. This anticipated STIR program initiative will destroy the open space and terraces that characterize this award-winning, mid-century site, and contradict the planning department’s official position to preserve the heritage of this site by including it on the post-1940 heritage register. This award-winning development carries an A heritage designation on the City of Vancouver Post 40’s Inventory indicating that it is the best example in the city of its type. It is almost the densest property of all ninety blocks in the West End already, and the genius of the design is that it is also among the lowest in site coverage. The true bulk of these enormous buildings is mitigated because they sit on stilts and are rounded at the corners. The design enhances livability by bringing ocean views, light and openness deep into the neighbourhood. This is the only triangular lot along English Bay that is not a park, and yet it manages to create a park-like aspect with sculptures, viewing terraces, gardens and open sky. Every apartment in the development, even those facing away from the ocean, has an ocean view. Every apartment manages to feel as if it is being thrust forward into the view, rather than being surrounded by the rest of the building. Their unique shape, the bay windows and rounded balconies create a wave-like rhythm that further softens them and helps them relate to their location on English Bay. The very distance between them and their neighbours helps mask the truly immense size of these buildings; each one is as large as all its neighbours combined. There is no aesthetic reason for infilling this site; nor is densification needed on an already immensely dense site. Indeed the site ought to be used by the city to inform planning in the rest of the city, rather than become a cash cow for its owners and a sacrifice to the densification ideology. The West End could be the greenest neighbourhood in the city. If an infill redevelopment can be built on the Beach Towers, then there are at least 60 other buildings ripe for plunder throughout the West End. This would spell the end of the gardens and open spaces that we so value and the end of the graceful green West End that the world reveres. Beach Towers Investment Inc. wants to build a fifth 22-story, 165-unit tower at Beach Towers on Vancouver’s West End Waterfront, as well as 25 stacked townhouses along Beach Avenue. They need Vancouver Mayor and Council to vote to rezone the entire waterfront city block bounded by Cardero Street, Bidwell Street, Beach Avenue and Harwood Street. For more information, go to www.beachtowers.ca.